Koojan Hills Angus kicked off stud bull sales this week with gusto, hitting a top price of $18,500 at Manypeaks on Monday. Despite drought and tough seasonal conditions for many of their regular clients, the care which goes into the breeding program at the Metcalfe family’s stud enticed buyers back to buy again this year. 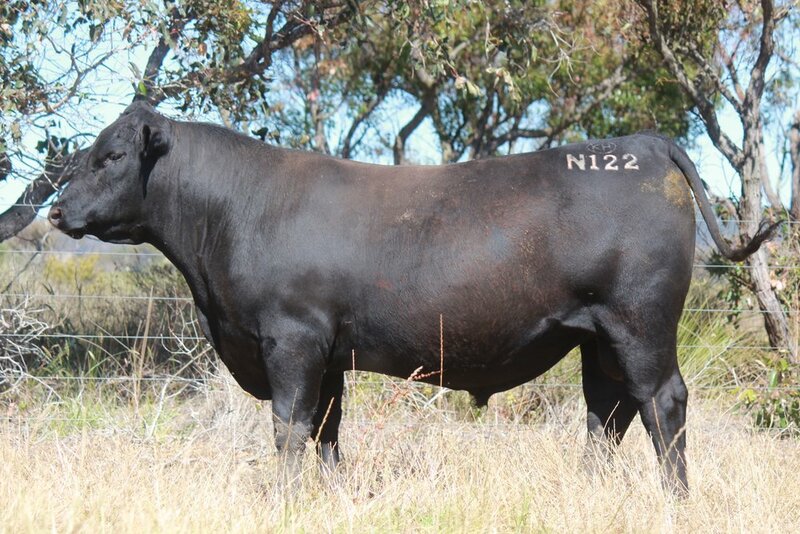 This years increased offering of 73 pasture-reared Koojan Hills Angus bulls reached a clearance of 60 under the hammer of Tiny Holly and the Landmark Breeding team, averaging $7,875. Down from the sky-high average of $10,208 set last year, the lower average was by no means a reflection of the quality on offer as the result stands well above Angus stud stock sale averages set so far this selling season. Demand from the 69 registered bidders in attendance pushed the value of top bulls past five digits on 13 occasions, right through to the end of the sale, with the bull in Lot 72 fetching a price tag of $10,500. Landmark auctioneer Tiny Holly said it was a great result for the Metcalfe family. “To see the average top Angus bull sales so far this season was a fantastic result.” Mr Holly said. At the very top end of the sale, Mr Holly and his off-siders calling the bids had their work cut out for them as several bulls drew bids from buyers across the stands. It was the sire in Lot 27 which ended up drawing the most attention, fetching the sale topping price of $18,500 when Koojan Hills Kaiser N91 was hammered down to Alan Greenwell, Bullrush Farms, Gingin. Local Landmark agent Harry Carrol had looked through the catalogue with the Gingin based buyer and said the Granite Ridge Kaiser bloodline drew attention. “The top priced bull certainly ticked a lot of good boxes,” Mr Carrol said. Bullrush Farms went on to buy another two bulls during the sale, including a July 2017-born son of VAR Discover 2240 for which he paid $10,500.